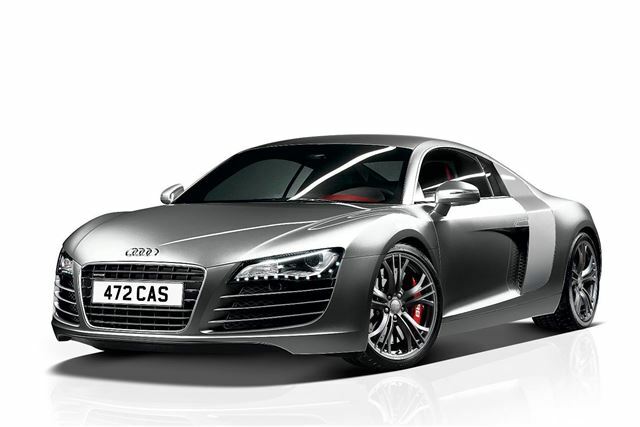 Audi has created the R8 V8 Limited Edition to celebrate the company’s tenth victory in the Le Mans 24 Hours. Only 100 examples are to be made, all of them destined for the UK market. The Limted Edition is available with a new titanium effect paintwork option and enhanced standard equipment. It’ll cost from £93,035 on the road and orders open in July. Titanium finish 19-inch alloy wheels and red brake callipers mark the special edition out, and metallic paintwork is available as a no cost option. The unique titanium colour pictured is the only colour that costs extra, and is exclusive to the Limited Edition. Inside the cabin there are red accents to the black leather seats, as well as red stitching on the steering wheel and instrument cowl, as well as red leather details on the doors and knee pads. Other options that are fitted as standard equipment include Audi magnetic ride, which adjusts damping to suit the road conditions. The Carbon Package, optional on other models in the range, is standard equipment in the Limited Edition, and it adds carbon fibre styling details to the sideblades, door mirrors and engine bay, as well as other small details in the cabin. Finally, buyers will be given the option of driving an R8 on track at Silverstone to see the full potential of their new purchase in a safe environment.